Our loved ones are unique, special, have their own personal flair. The resting place for their ashes should be a reflection of them on a personal level. Our selection of engraved plates and easels allow you to capture them with words and add that to your cremation urn display in their memory. So no matter the urn, there are options for making it your own and having it be a personal reflection of your loved one. Think color. Our engraved plates and easels are available in a wide variety of color combinations. 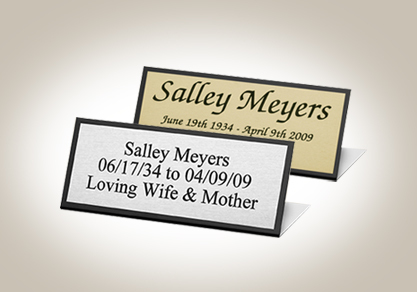 Choose on the simple side and select an engraved plate in silver aluminum or gold brass. 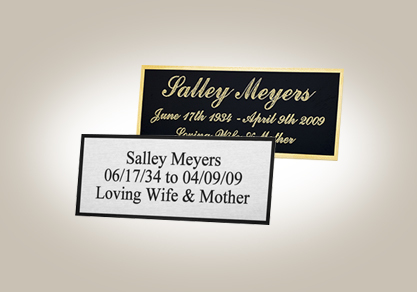 Or you can go more elaborate and choose an engraved plate or easel with a back plate and a top plate, creating extra depth and color to your engraved personal memorial. Engraving style. Our engraved plates are available in laser engraving as well as mechanical engraving or scribed. With laser engraving, the lettering is very precise and the resulting engraving has the appearance of having been printed onto the face of the plate when in fact it has been laser engraved. Mechanical engraving is where the lettering is engraving or scribed onto the surface of the plate and you can actually feel the edges of the letters when you rub your hand over the top of the plate. Both are beautiful and allow for a personal way to remember a loved one. Compliment the size of your urn. 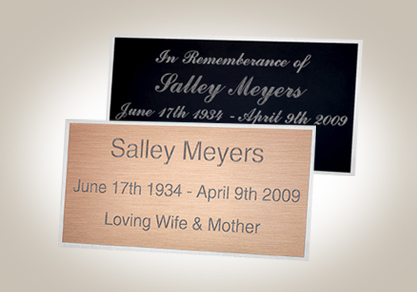 Because we offer three sizes of engraved plates, you can choose the size that will best compliment your urn and your own personal sense of style and decor. For smaller urns, you can choose a small plate which takes up a limited portion of the face of the urn. Or you can elect to go with a plate that encompasses the majority of the face or a flat surface on the urn for a more dramatic look. Larger individual or companion urns typically look better aesthetically with a medium or large engraved plate and the plate can be strategically placed so as to not draw attention away from the beauty of the cremation urn. Easels are best for round or odd shaped urns. Because our engraved plates adhere best to a flat surface, a cremation urn that is rounded or atypically shaped can best be personalized by choosing an engraved easel to sit alongside the crematory urn. The engraved easel is also a great option to display next to a picture or other memorial to your loved one. 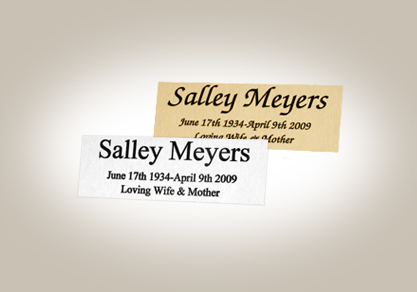 Personalized plates and easels are an expressive way to show your love and devotion to those that have passed. Beautiful materials and finishes combined with personally selected words helps families to capture their sentiment and display it in a beautiful manner.